This dark, leafy green has been known as a superfood for many centuries, and is one of the most popular vegetables among health-conscious foodies. According to BBCGoodFood.com, spinach originated from Persia (modern day Iran), and became popular in Europe during the 12th century. Spinach is part of the chenopodiaceae or goosefoot family of vegetables, along with beets and chard, which have a similar taste, and even quinoa. The vegetable is usually available in three varieties based on the crinkliness of the leaves: savoy, semi-savoy, and smooth leaf. When choosing spinach, select those with medium to dark green leaves that don’t show any signs of rot. The vegetable can keep for around four days if refrigerated in a sealed plastic bag. Washing spinach before storing can accelerate spoilage, so it must only be washed right before consumption. When it comes to health benefits, spinach packs a powerful punch, containing high amounts of nutrients that make it effective at preventing and treating a number of health conditions. 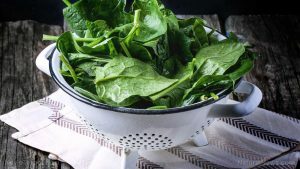 According to MedicalNewsToday.com, the chlorophyll in spinach doesn’t just give it its dark green color — the pigment has also been known to protect against the carcinogens in grilled food, effectively preventing cancer. Spinach helps with diabetes management, as it contains the antioxidant called alpha-lipoic acid, which lowers glucose levels, improves insulin sensitivity, and inhibits oxidative changes in people with diabetes. The vegetable lowers the risk of developing asthma, due to the high amounts of beta-carotene that it provides. As a rich source of potassium, spinach has been effective in regulating blood pressure. Potassium cancels out the negative effects of sodium in the body, improving the blood pressure of those who have hypertension. Spinach is also rich in vitamin K, which improves the absorption of calcium in the body, therefore leading to stronger bones and teeth. Those who experience constipation can eat spinach to improve their bowel movements. Spinach is high in both fiber and water, which support better digestion. With elevated levels of vitamin A, spinach benefits hair and skin health, stimulating growth and improving sebum production to prevent dryness. Spinach also contains a considerable amount of vitamin C, which contributes to the production of collagen, the base protein for skin and hair. Iron-rich spinach also prevents hair loss, which is often caused by iron deficiency. Spinach has a unique leafy flavor that adds a healthy, fresh taste to many dishes. Based on recipes on Saveur.com, spinach is commonly eaten raw as the base for many salads, or blended along with artichokes, nuts, or other vegetables to make a nutritious dip or spread. The vegetable goes especially well with cream and cheese, and it features in many cream-based pasta recipes and casseroles. Other recipes involve sauteeing spinach, including it in soup, or using it to stuff roasts. Spinach is good for cancer prevention. It can aid in the management of diabetes. It can also prevent asthma. Spinach regulates blood pressure in those who experience hypertension. It can prevent a relieve constipation while maintaining smooth digestion. Spinach keeps skin and hair healthy. It can also prevent hair-loss.